Speaking of Aaron..color genetics fun! When Aaron was born, his red/gold brindle pattern was apparent. His hair grew longer; the brindle pattern became less and less visible. As he matured, the greying factor began to work upon the brindle hair. 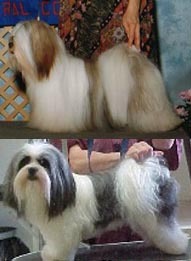 He underwent a transition from what appeared to be a gold and white parti-color dog to a black and white parti-color dog. Some of his offspring, including Frankie, Robby and Allie, inherited his brindle coloration. See more photos of this phenomenon.